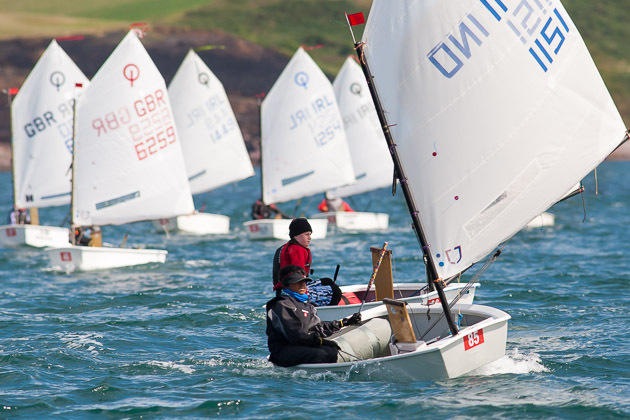 The great buzz of the competitors arriving at the Club heralded the commencement of today’s racing for the CH Marine Irish Optimist National Championships in Crosshaven. Today was very much down to business with the sailors feeling more familiar with their surroundings and having had the experience of the first day of racing over them. 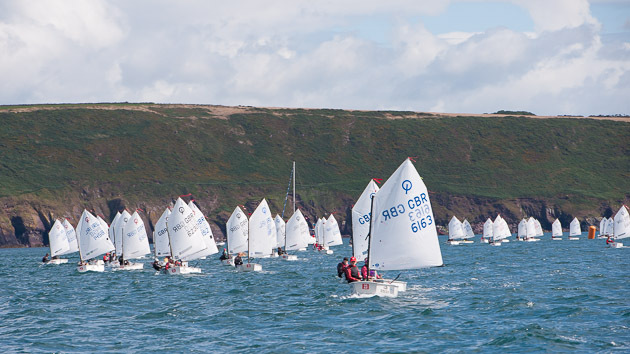 Today the racing for the Senior and Junior fleets was to the east of Roches Point and the Regatta fleet once again raced on the Curlane Bank. Off Roches Point the racing commenced in a northerly breeze gusting at irregular intervals between 5-6 knots with stronger puffs of some 10-12 knots. These would last for a few minutes and then ease off. Direction remained steady enough given the pulsing pattern of the breeze. 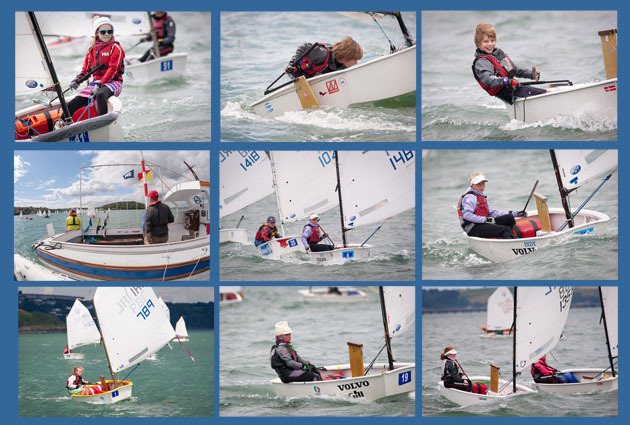 As usual, Main Fleet Juniors started racing first. 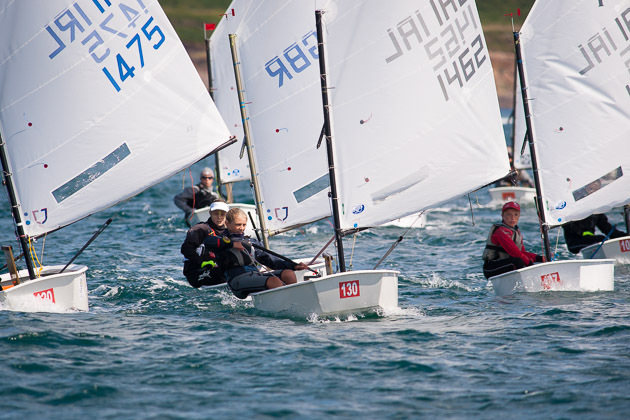 The Senior Fleet started their first race after a short postponement and, after a general recall, the next start took place under a black flag. The breeze, previously steady in it’s pattern started to shift and die. As the race got away a new breeze clicked into place with a greater westerly component. This was to set the pattern for most of the day. The Seniors played a game of snakes and ladders with the new breeze with some of the sailors not finding the dramatic shifts very favourable to them. The second race had darkening skies with the breeze having solidified into a good range for racing. It was still gusty but there was a bit more bite for the experienced sailors to work with. This start was also difficult with a general recall and the resultant black flag appearing for the next start. Tide and line bias conspired against the sailors and many fell foul of the black flag at the pin end. This was somewhat frustrating for the affected sailors as this was the first good breeze they had seen during the championship so far. The third race started with all the sailors more cautious approaching the line. Well into the first beat the wind dropped and shifted leaving many boats trickling very slowly into the windward mark with another opportunity lost to the variable conditions. This set the tone for the remainder of the race with the sky brightening but the wind staying light. The Race Officer then took the decision to shorten the race and the sailors commenced their long haul back to the club house. 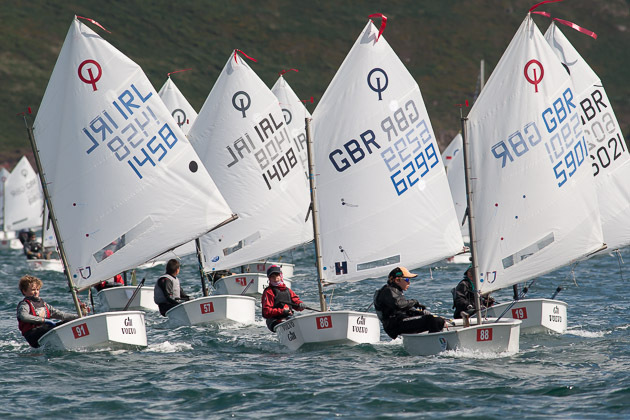 In the Main Fleet Junior Division Michéal O’Suilléabháin leads on 13 points while in second place is UK visitor William Heathcotte one point behind, next is Spanish visitor Arnau Gelpi on 15 points and in fourth place is Tom Higgins of RStGYC on 19 points. These results are after five races with one discard. 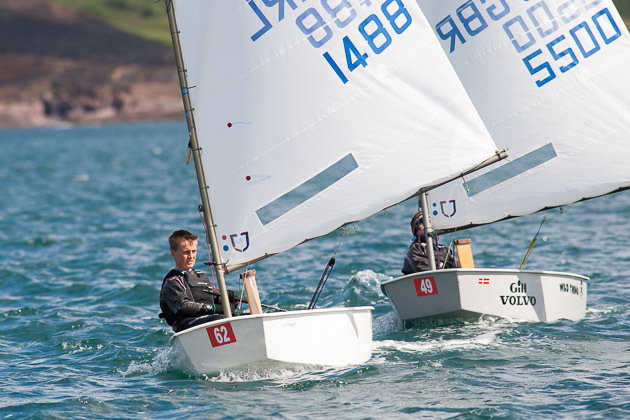 Meanwhile, the Regatta Fleet had been enjoying excellent racing with Race Officer Eddie Rice on the Curlane Bank. They were sailing in a light breeze that occasionally surprised the young sailors by gusting to about 12 knots. 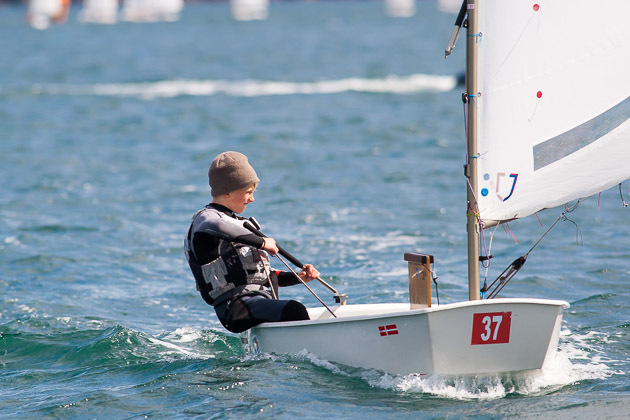 It must be said, though, it is very easy to see that the future of Optimist sailing looks very bright indeed having watched some of these young competitors at the start and the competence shown when the breeze strengthened and some capsizes occurred. Some were a little nervous of course but everyone coped very well and they are a credit to their trainers and coaches. They really enjoyed themselves and even managed a smile for the camera! They came ashore in fine form and once they had their boats safely and neatly tucked away were preparing for a special visit to the Crosshaven RNLI station. Forecast for tomorrow (Sat) is similar with perhaps a stronger looking wind profile as the day progresses.